Learn how to make homemade yogurt in your oven, no special equipment needed. It’s super easy and delicious and will save you money too! I’ve been making homemade yogurt for at least 8 years now and we eat so much of it that I cringe to think how much it would cost us if we started buying store bought instead of using homemade! 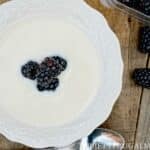 The thing I love about this recipe- besides that fact that it’s super cheap and saves us money- is that the method used for the yogurt making process is very simple and basic. You don’t need any fancy equipment and there’s a good chance that you already own all the things that you need to get started making your first batch of homemade yogurt! Making homemade yogurt isn’t difficult, but there are a few things that are helpful to know before you get started. 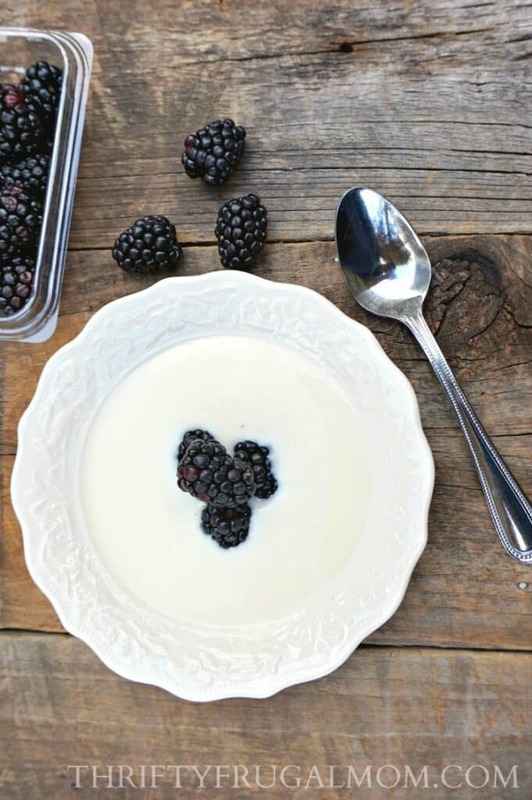 You can use any type of dairy milk to make homemade yogurt (including raw milk! ), although whole milk will produce the thickest, creamiest yogurt. To get your milk to culture and become homemade yogurt, you will actually need to add a bit of yogurt to it. You can use regular or Greek yogurt as long as it lists “Live Active Cultures” in the ingredients or on the container. That culture is what will make the milk turn into yogurt. It’s best to use unflavored yogurt for this, although I have occasionally used vanilla flavored yogurt and it’s worked okay too. You can actually make homemade yogurt without adding the gelatin if you want. Adding it just thickens the yogurt a bit and makes it less runny and we prefer the consistency of the yogurt with it in. My recipe says to culture the yogurt for 8 hours. You can actually adjust that time if you prefer. Basically, you need to let it culture for at least 4 hours for it to become yogurt. The longer yogurt sits and cultures, the thicker and more tart it becomes. We love the taste and tartness of 8 hours, but feel free to play around with it. And if you are like me and put the yogurt in the oven to culture overnight while you are sleeping and you happen to sleep longer than 8 hours, stay calm- it will still be good! It just might be a bit more tart than usual! If you are a fan of Greek yogurt, you can make yogurt using this recipe and then just strain it. Straining it will drain off the whey, leaving you with a thicker, denser Greek style yogurt. (Most people like to use cheesecloth to do the straining.) If you strain it, you’ll obviously end up with less yogurt as well as whey. If you aren’t sure what to do with the whey, Google it! There are lots of great uses for it! Alright, are you ready to get started? Here’s my easy step by step process to make yogurt! This homemade yogurt is made in your oven, no special equipment needed. 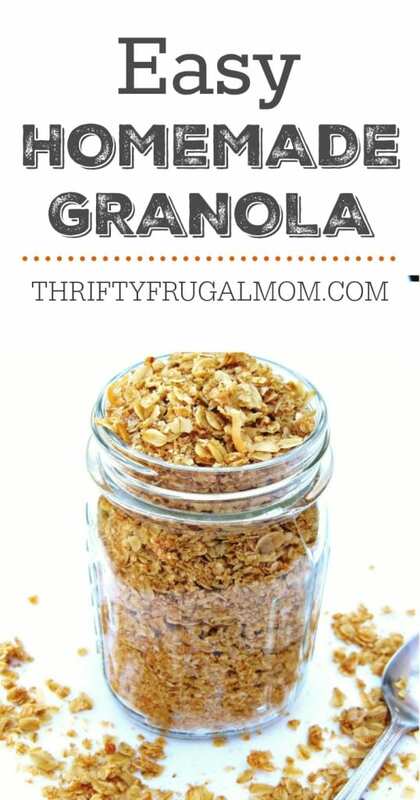 It's super easy and delicious and will save you money too! Mix gelatin into 1/3 c. cold water. Let set. Using medium heat, heat milk to 190 degrees, stirring occasionally. Remove from heat and add gelatin, sugar and vanilla. Whisk well. Add commercial yogurt and stir well with a wire whisk. Pour into 2 quart jars (or whatever containers you want to use); screw on lid. Place in oven close to the oven light. Turn oven light on and close the oven door. Let set for 8 to 10 hours. * I often use raw sugar to make it healthier. But you can omit the sugar altogether if you’d like. You may especially want to do this if you plan to stir in jelly, pie filling or jello as detailed below. ** Once you have some of your own homemade yogurt, you can just use that for your starter yogurt instead of the bought yogurt. I usually buy yogurt approximately every 12 times to use as a starter, since it does seem that after a while the yogurt just doesn’t get quite as good. To add flavor, stir in fruit (whole or blended), jelly, pie filling or dry flavored jello. Hi! I made your yogurt and OMG! It is delicious.! 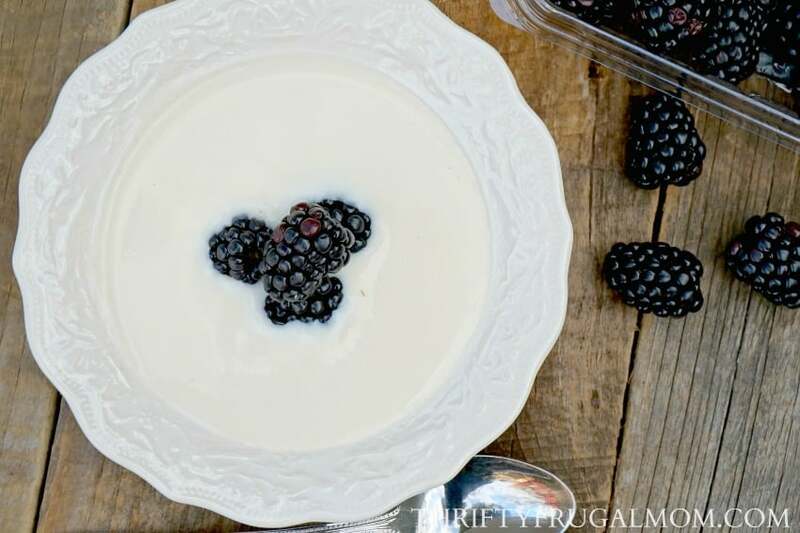 There are many recipies for homemade yogurt using one's crockpot but I prefer your method. Whohoo! So happy to hear it! :) And yes, I find the oven method SO much easier and less hassle than anything else....other than maybe an Instant Pot. I just got one of them and am experimenting making yogurt with it, although I'm still trying to decide if I think it's better than this method. But the beauty of this method too is that you don't have to go spend money on another kitchen appliance! We usually eat ours within 2 weeks, but pretty sure I've had it in our fridge for as long as a month and it was fine. Freezing it would totally change it's consistency, although I've wanted to try freezing a little bit to see if it would make kind of a popsicle type of thing. But I've never tried it. I do know that if you freeze it and want the same yogurt texture once it thaws, it won't work. About how long does it take to heat and then cool the milk to these temperatures? I currently make my yogurt using a crockpot and need to heat the milk for 3 hours then cool for 3 hours before adding the culture and letting it incubate overnight so that means starting the process around 3:00 in the afternoon to have it ready for the evening. Does this method take that long? I would love to try it! I'm not entirely sure because it depends on how high you turn your burner to heat the milk and whether you have a gas or electric stove and then for cooling, it depends on how hot or cool your house is. But on average, I'd say it takes maybe 30 min. to heat the milk and then an hr. at most to cool it. If you want to speed up the cooling process, you can always put the kettle in cool water to lower the temp more quickly too. At any rate, I know that it definitely doesn't take anywhere close to 3 hrs. for either step! So, hopefully that helps. I made yogurt today using this recipe and I love it! It only took a total of 1 hour for the heating and cooling process- no more waiting 6 hours on the crockpot! I love that I can make it in the morning, put it in the oven and forget about it 'til evening. Next time I'll make a double batch because we like our yogurt really thick so I always strain it which of course leaves less yogurt. Thanks again for sharing this great recipe! So glad that it worked so well for you! Isn't it fun when you can find ways to save time on things like this? I do not own a thermometer yet! Is there one you would recommend? This is the thermometer that I've used for years. I like that it can clip on the sides and is inexpensive. But you do have to watch how you handle it since it's glass and more fragile. I've thought of getting a digital one but... :) Hope that helps! My oven doesn't have a light on it. Do you have to have an oven light to make this recipe? I'm sorry, but you do. The light is what keeps the yogurt at the warm temperature that it needs to be at to culture. There is another method that I know some people use. Basically you do steps 1-5 but then to culture the yogurt you pour hot water (about 120 degrees in temp) into a big cooler and fill it until the water is high enough to go about halfway up a quart size jar. Then you ladle the hot yogurt into jars/containers and put lids on them. Place the jars into the cooler with the water. (Again, the water should come about half way up the containers that you choose to use for you yogurt.) Close the cooler and cover it with a big blanket or a couple of towels to help insulate it. Let sit for 8 to 10 hours, then remove and refrigerate. Hope that helps! So glad to hear that you all have been enjoying this Kim! And that's some impressive yogurt savings too. Don't you love when you find an easy way to make your own favorites for so much less? Thanks too for the tip about sugar and gelatin. I always assumed that it would stick the bottom of the pot and cause it to burn. Interesting that you haven't had that happen!